Derrick Miliner was born July 3, 1960 in Gadsden, Ala. His parents were practicing Catholics, and Derrick attended St. Martin Deporres Catholic School from age 6 to 9, serving as an altar boy. In 1969, when he was 9 years old, Derrick’s father died. Derrick switched to a public school for financial reasons and the family began to attend First Missionary Baptist Church in Alabama City. He attended Bible study, sang in the youth choir and, at the age of 13, was baptized. He continued at First Missionary Baptist Church until he joined the U.S. Army in 1978. Derrick was stationed at Walter Reed Army Medical Center in Washington, D.C., from 1978 to 1981. He then left the Army and became a civilian government employee, first at the U.S. Department of Agriculture and then back at Walter Reed. He rarely attended church. It was not until 1988, after drug and alcohol rehabilitation and his marriage to his wife, Robin, that he realized he had to go back to what his mother had taught him: Jesus Christ. Derrick and Robin attended the main chapel at Walter Reed until May 28, 1989. On that crucial date, they were visiting Walter Reed’s Forest Glen Gospel Chapel when Derrick sensed the Holy Spirit calling him into active ministry. Under the chapel’s pastor, the Rev. James Hall of the Church of God in Christ, Derrick was ordained a deacon in that denomination on July 2, 1989. In 1990, Derrick and his wife Robin moved to San Antonio, Texas, where she was stationed at Fort Sam Houston. Derrick was active at the Fort Sam Houston Chapel for the next four years and, in 1993, co-founded with two chaplains the Fort Sam Houston Gospel Care Center, which continues as a congregation today. After Derrick and Robin returned to the Washington area in 1995, they searched for a place to worship for two years as Derrick completed an undergraduate degree in Health Care Management from Southern Illinois University, which held classes at the National Naval Medical Center in Bethesda. 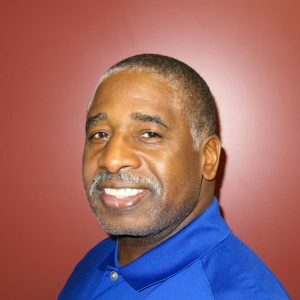 They joined Calvary Lutheran Church in Silver Spring in 1997, the same year Derrick became an employee of the U.S. General Services Administration. Derrick served as an elder, vice president of administration, and minister of outreach. In 1998 Derrick accepted God’s call to enter the Lutheran Lay Ministry extension program of Concordia University, Mequon, Wisc. He also entered a graduate program in Telecommunications from the University of Maryland University College, earning a Telecommunications Management degree in 2002. On May 17, 2003, he was certified as a Lutheran Lay Minister and Professional Church Worker, and the following year was installed as an official Lay Minister at Calvary Lutheran. He provided pastoral support, carried out evangelism, and led liturgy at the pastor’s discretion, including assisting with Holy Communion. In 2004 Derrick received a call from Concordia Lutheran Church in Upper Marlboro, Md., to become the minister of outreach and an assistant Lay Minister. As a Lay Minister, he led liturgical worship services, developed outreach teams, taught Bible studies and supported the overall life of the church under the mentorship of Pastor Lloyd Gaines. In 2009, Derrick ended his ministry at Concordia in Upper Marlboro to spend more time with Robin and their 4-year-old daughter, Grace. They transferred their membership to Our Savior Lutheran Church near their home, in Laurel, Md. Derrick took a sabbatical from active ministry from 2009 through 2014. Derrick returned to ministry in January 2014, serving as a liturgist at Our Savior in all three worship services. In January 2015 he started a full-time Specific Ministry Pastor Certification program at Concordia Seminary, St. Louis, Mo. Derrick retired from the federal government on July 3, 2015 with 37 years of service. He was installed as an Associate Pastor at Our Savior Lutheran Church on June 11, 2017. He will graduate with a pastoral certification from Concordia, St. Louis in May 2019.